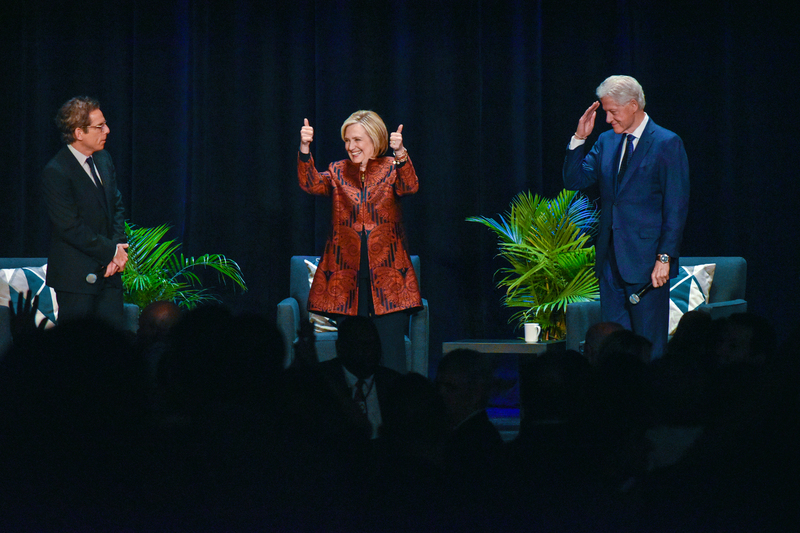 Former President Bill Clinton and former Secretary of State Hillary Clinton decried the role that social media plays in modern politics, and in our day to day lives, while speaking in Detroit Friday night. The event at the Fox Theatre downtown was hosted by actor Ben Stiller and is part of the couple’s North American speaking tour. Both Clintons agreed that one of the most helpful aspects of meeting people, either as a candidate or in office, was hearing their stories – something that they said is less likely to happen with the rise of selfies and tweets. Hillary Clinton, a former first lady, U.S. senator, secretary of state and 2016 Democratic nominee for president, noted that she would often hear about the opioid crisis even before it was getting media attention. That clued her into an issue that matters to everyday voters. Beyond its impact on how candidates campaign, however, the Clintons also expressed concern over the effect that social media is having on other aspects of life and politics – including spreading fake news. “The thing that’s frustrating about today is it’s so hard given the information eco-structure, including all the stuff on social media, to know the difference in fact and fiction, and sometimes a lie works better than the truth. They say our attention span for hearing one person talk on the evening news, even the president, is between 8 and 9 seconds,” Bill Clinton said. Hillary Clinton talked about what this means for the next generation. “How do you encourage your child, in our case, now grandchildren, to be engaged in the world without getting sucked into what is an artificial construct of the world? When people say they have friends they’ve never met, that’s never happened in human nature in the history of the world,” she said. Ultimately, traditional media still does have a place in politics, the Clintons said, noting that both start their day reading a physical newspaper. But after decades in politics, they’ve learned to disassociate themselves from what they see in those newspapers. “We’ve had to, or we’d probably never get out of bed. We’ve had to figure out what is real and what’s not real. I remember so many years ago, for the first time reading an article that I knew was absolutely untrue; this was, I don’t know, 35 years ago. From then on, I learned to take criticism seriously, but not personally. If you’re in the public eye, people are always saying things or offering ideas, suggestions. So to try to take that in and take it seriously, but not to let it eat away at you,” Hillary Clinton said. One of those potentially hurtful criticisms is a social media narrative suggesting that the Clintons should go away after Hillary Clinton lost the 2016 election to now-President Donald Trump. Lt. Gov. Garlin Gilchrist, who attended the event, said he does not agree with that idea. “I don’t need anybody to be quiet. I think anybody with good ideas should be able to present them,” Gilchrist said. Other notable attendees included U.S. Rep. Haley Stevens (D-Rochester) and Flint Mayor Karen Weaver. Hillary Clinton narrowly lost Michigan to Trump in the 2016 presidential election, making it a key target for both parties in 2020. Clinton’s opponent from the 2016 Democratic presidential primary, U.S. Sen. Bernie Sanders (I-Vt.), scheduled a 2020 campaign rally in Michigan for one day after the Clintons’ visit. He narrowly defeated her in the March 2016 primary here. Sanders is the eighth presidential candidate to announce a trip to the state. Other candidates to have visited or planned visits include technology executive Andrew Yang, former U.S. Rep. John Delaney (D-Md. ), U.S. Sen. Amy Klobuchar (D-Minn.), U.S. Sen. Kamala Harris (D-Calif.), U.S. Sen. Kirsten Gillibrand (D-N.Y.), former U.S. Rep. Beto O’Rourke (D-Texas), and President Donald Trump. Hillary Clinton has said she isn’t running in 2020. While both Clintons declined to offer thoughts on any specific presidential contenders, saying they are going to “let the candidates run their own races,” Hillary Clinton did say that they should be allowed to discuss policies.